Dalia Tikki - Broken Wheat Cutlet make great tea-time snack, brunch or breakfast. When you have Dalia Tikkis for breakfast, you will have more energy, and you will feel satisfied the whole day. 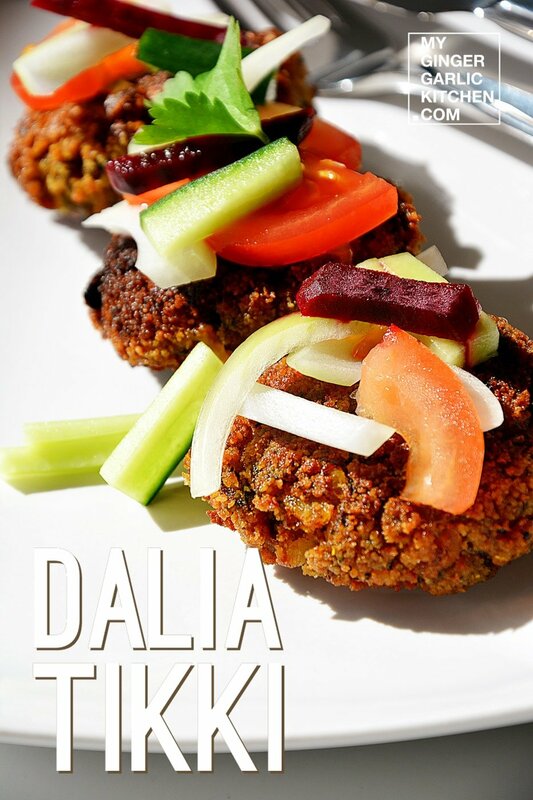 These dalia tikki (cutlets) are prepared with dalia, boiled potatoes, boiled vegetables, spices. Tikki is a hearty, satisfying, Indian spicy snack. Dalia Tikkis are cutlets, which are very rich in fiber. These give you high energy, and at the same time they are very low in calories. Dalia Tikkis are healthy and nutritious. These are perfect for you, if you are weight watcher. What is the perfect time to have these fulfilling & healthy Tikkis? Breakfast time is excellent for Dalia Tikkis. When you have Dalia Tikkis for breakfast, you will have more energy, and you will feel satisfied the whole day. Can I bake Dalia Tikki? Dalia tikkis are shallow-fried, but you can also bake them in the oven. Simply brush the tikkis with oil and bake them in 175°C pre-heated oven for 25-30 minutes or until they are golden and crispy. How do you serve Dalia Tikki? Dalia Tikki can be eaten simply as a breakfast/snack, or you can use them as a patty for your wrap or sandwich. Dalia tikkis are very easy to make, and they have a very delightful texture and taste. Tikki chaats are usually made with tikkis (cutlets), Chickpea Curry, Coriander Chutney, Tamarind Chutney, onions, yogurt, and spices. 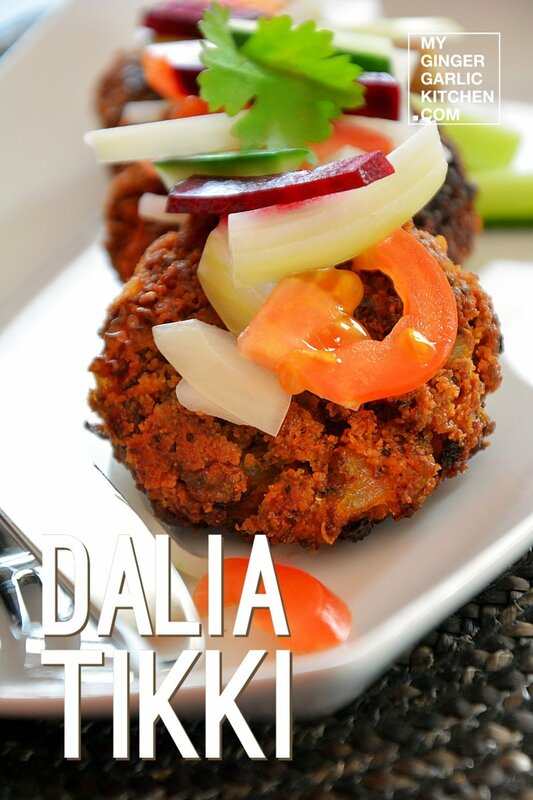 These dalia tikkis can also be served as a burger patty. To make dalia tikki chaat, serve this dalia tikki along with the above ingredients. To make a burger out of this dalia tikki, you can plainly arrange this tikki on the bottom of bun, top with lettuce, cheese slice, layer with mayonnaise and tomato ketchup and served with the buns and tomato, onions and lettuce. The most incredible delicious and healthy burger is ready to serve. • 1 teaspoon chaat masala. 1. Add dalia, potatoes, boiled vegetables, onions, green chilies, lemon juice, ginger-garlic paste, 5 tablespoons breadcrumbs, along with all the spices to a large mixing bowl. Mix everything well to combine. 2. Divide the dalia mixture into 7-8 portions. Make a ball of each portion, and flatten between your palms into the shape of a small tikki/cutlet. Coat each cutlet with breadcrumbs. 3. Heat oil in a pan over medium-heat. 4. Shallow fry all the tikkis from both sides till they turn golden coloured and crisp. 5. Serve hot with ketchup or Chuteny .